In addition to the listed routes, various worthwhile eliminates or variations exist. These take alternative lines adjacent to the routes, mostly avoiding the normal lines of the routes themselves. As such they tend to be somewhat harder than their adjacent routes. Some of the eliminates can be lead using the closest bolts to the line, others are better tried using a top-rope from the nearest route. Take your pick. Please note all suggested grades are rough guides, as how hard the line feels depends on how much discipline put into avoiding the moves of the routes themselves. Start about a metre to left of Kavouras proper in the middle of the blank wall. Climb up the centre of the blank part on small crimps and flakes. Take the bulge direct (using Kavouras crux holds) and continue up the centre of the wall close to the line of the bolts. Start slightly to the right of Kavouras proper. Climb up to the shallow corner on small edges, avoiding the (better) holds of Kavouras. Then instead of launching left over the bulge, take the awkward corner direct. Climb using only the thin crack for the hands that forms part of Kavourina (feet anywhere) until it runs out near the top. Then finish as for Kavourina. To make it still harder, use the feet only in the crack too (F7a+?). Climb the orange wall just to the right of Kavourina/crack, avoiding the crack. Gain the good horizontal flake, then again launch out on the orange wall to the break. Continue to the top (again) avoiding the holds of Kavourina on the left. Take the blankish orange wall between Right of Crack and Epea Pteroenda proper. Climb just to the left of the route proper on very small crimps. At the top finish as for Epea Pteroenda. Sustained and fingery. 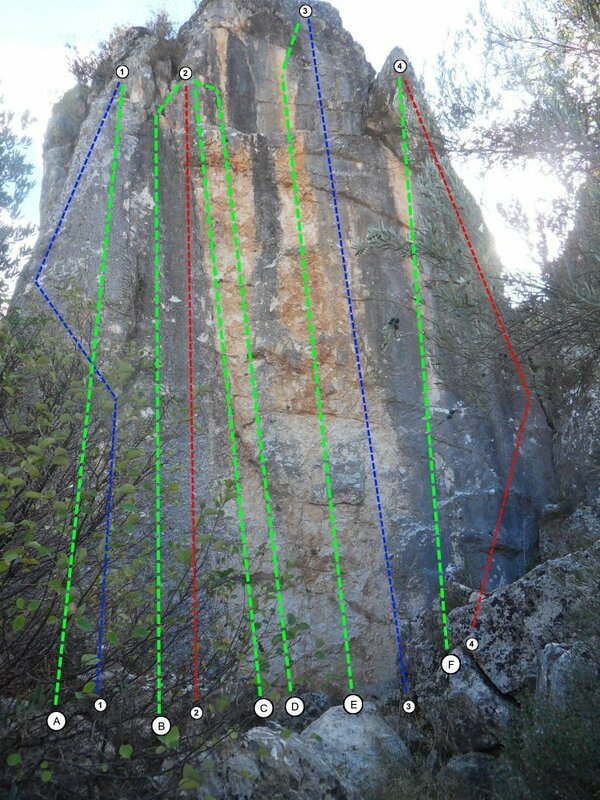 Start as for Esieksiksi, but instead of moving right towards the arete, continue up the very blank wall. Finish up the centre (steepist bit) of the bulge. Impossible?